A thousand years ago navigation at sea was more an art than a science. Today, few sailors would contemplate a voyage without a compass and charts. Yet well before Europeans were exploring the world, Arab sailors had successfully crossed oceans without conventional navigational tools. Arab navigators were famous for their great powers of observation and sharp memories. They used all their senses to observe the colours and patterns of the sea and the sky. They also used the sun, the moon and the stars to find their way. When the Jewel of Muscat left Oman on the voyage to Singapore the crew took modern navigational equipment to monitor the ship’s performance. However they also experimented with some of the ancient techniques used by Arab navigators. Celestial navigation is the science of finding your way by the sun, the moon, the stars and the planets. Humans have been finding their way using the sky for thousands of years. For at least two thousand years, navigators have known how to determine their latitude — their position north or south of the equator. At the North Pole, which is 90 degrees latitude, Polaris (the North Star) is directly overhead at an altitude (a height) of 90 degrees. At the equator, which is zero degrees latitude, Polaris is on the horizon with zero degrees altitude. Between the equator and the North Pole, the angle of Polaris above the horizon is a direct measurement of latitude. To measure their latitude Arab navigators made a simple instrument called a kamal. This is a small rectangular wooden card with a string attached through a hole in the middle. Before leaving his homeport, the navigator would take his kamal and putting the string in his teeth, look towards Polaris. He would then stretch out his arm, keeping the string tight, to the position where he could see Polaris at the top of the kamal and the horizon along the bottom. He would then tie a knot at the point where his teeth touched the string. To return to his homeport, he would sail north or south as needed, observing Polaris with the kamal and with the knot between his teeth. At the point where the star was on top of the kamal and the horizon was on the bottom he would turn towards home knowing he could sail down that latitude to his homeport. Over time, Arab navigators started tying knots in the string of the kamal at intervals of one isba (or issabah). The word isba is Arabic for finger and it measures an angle of about 1.5 degrees, or approximately the same as a finger width on an outstretched hand. For the ports they visited frequently, they would tie a knot on the string of the kamal to correspond with the altitude of Polaris for that location. Polaris stays almost motionless in the sky, and all the stars of the northern sky appear to rotate around it. Therefore, it makes an excellent fixed point from which to draw measurements for celestial navigation in the northern hemisphere. 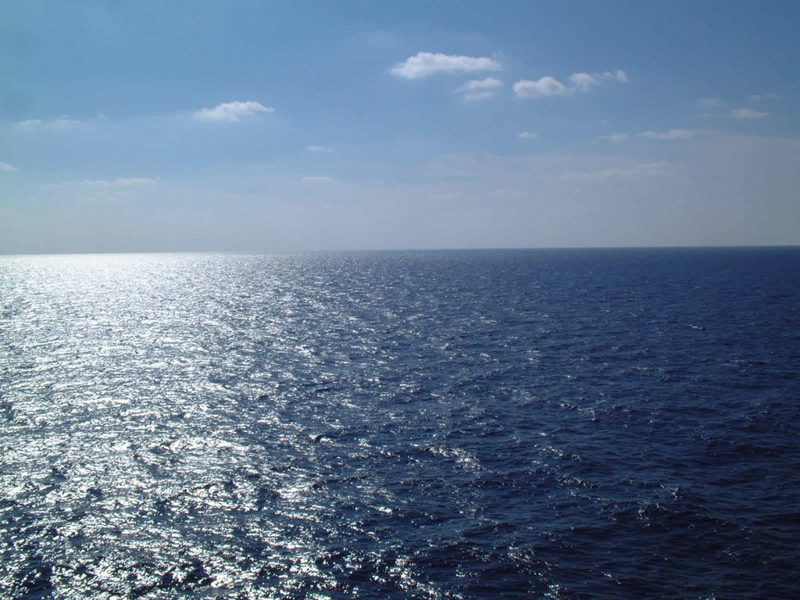 As a ship approached the coast a crewman would throw a lead line into the water to check the depth. A lead line was a length of rope with a neavy lead weight attached. The rope had marks along it to indicate the depth. The lead sometimes had animal fat smeared into a hollow in the bottom to pick up a sample of the seabed. When the lead was pulled up the captain would know the depth of water and the type of seabed beneath the ship. This information might give him a hint of where they were and also give him an idea if the seabed was suitable for anchoring. An object that has been interpreted as a lead line sinker was recovered from the Belitung shipwreck which is the model for the Jewel of Muscat reconstruction. A copy of the lead line sinker will be used on the voyage of the Jewel of Muscat from Oman to Singapore. At sea a constant lookout was kept, particularly if the captain thought the ship was approaching land. Crewmen would keep watch at the bow and also from the crow’s nest high in the rigging. The presence of certain fauna (birds, whales and sea snakes). Many species have restricted migratory paths or regional ranges and their appearance could give clues to where the ship was. Sky colours and cloud formations hinting at land just over the horizon. Changes in water colour indicating changes in depth, the composition of the bottom or the presence of rivers running into the sea. Water temperature changes which could be a sign the ship was moving into a new current. Smells on an offshore breeze bringing warnings of land just over the horizon. Charts and ship logbooks were not in use 1000 years ago so Arab sailors often composed songs and poems to record their observations. These would help them remember things they had seen at sea or details of new lands encountered. Before the magnetic compass came into common use the Arab navigators used a 32-point star compass that indicated the rising and setting positions of groups of stars. They would memorise the star groups and the position on the compass where they would rise and set. They would use these stars to help steer the ship in the right direction. Ships’ speeds were not calculated at that time. Distances were measured in terms of a day’s sailing. One day’s sailing north or south would raise or lower the height of the pole star one issabah (a finger width or about 1.5 degrees) as measured by the kamal. In today’s measurements that would be a distance of around 90 nautical miles. Arab navigators would use the sun, stars, the moon and planets to find out where they were. For at least 2000 years navigators have been able to determine their latitude. Arab navigators in the 9th century did not use a magnetic compass. When the Jewel of Muscat sailed to Singapore they used both ancient and modern navigational techniques. 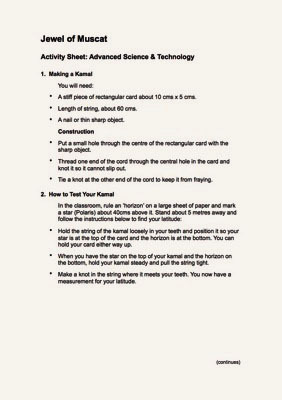 The kamal is a navigational device for measuring latitude and the height of a star above the horizon using eyes and teeth. If Polaris is 90 degrees above the horizon you are at the North Pole, which is in the northern hemisphere, and therefore you will feel cold. Isba (or issabah) is Arabic for finger. On the Belitung Island shipwreck the archaeologists found a replica lead line sinker.